The faculty nursing shortage has been cited as a reason that qualified students are not admitted to nursing programs. Programs fill the faculty gap by relying on qualified, part-time faculty to teach clinical rotations. The purpose of this article was to review the evidence of what is needed for part-time clinical faculty as they assume the faculty role. Using a systematic approach, 19 articles were included in this integrated review. Themes identified included Mandatory/Structured Orientation, Mentoring, Support, and Communication/Connection. Issues of Pay and Compensation and the Transient Nature of Year-to-Year Contract Work were also themes found in this review. The United States is in a workforce shortage in the health field. The RN shortage has perhaps obscured the trend toward a nursing faculty shortage. Although the nursing shortage has received a significant amount of publicity, the shortage of nursing faculty has been emphasized less (Roberts, Chrisman, & Flowers, 2013). The American Association of Colleges of Nursing (AACN) conducted national surveys in 2016 and identified 1,567 faculty vacancies in the United States, as well as a need to create nearly 133 new positions to meet the demand (AACN, 2017). The shortage of nursing faculty was the main reason 64,067 qualified students were turned away from nursing programs during the 2013–2014 academic year (AACN, 2017). The National League for Nursing (NLN, 2014) indicated that 28% of qualified students were turned away from nursing programs with 45% being turned away from associate degree nursing programs. The primary reason qualified students were rejected from nursing programs was due to the lack of nursing faculty. In addition to the shortage of classroom course instructors, the lack of qualified faculty has been felt in clinical instruction, which requires a much lower faculty-to-student ratio than that of the classroom. Approximately half of students' time in a nursing program is spent in the clinical setting (Benner, Sutphen, Leonard, & Day, 2009; Ironside, McNelis, & Ebright, 2014). A tremendous amount of knowledge is gained and applied throughout a student's clinical experience, making this a crucial area of development for new nurses. The need to hire adequate numbers of qualified faculty to teach students has prompted nursing programs to turn to many part-time and adjunct faculty. The NLN reported challenges with recruiting and retaining qualified nurse faculty, providing adequate preparation to nurses specific to teaching, sustaining and funding nurse faculty programs, and the aging nursing faculty workforce (NLN, 2014). Most part-time and adjunct faculty are RNs who are clinical experts in their own practices. Meyer (2017) indicated that a great advantage of hiring part-time clinical faculty was their current clinical expertise. Many nursing programs have been using part-time clinical faculty to fill the need for clinical supervision of students in rapidly expanding programs. Although part-time clinical faculty may be expert clinicians, many lack formal knowledge about the academic setting (Koharchik, 2017; Meyer, 2017). Expert clinicians bring an abundance of clinical knowledge to the academic setting; however, their expectations are often “incongruent with the realities of the faculty role” (Grassley & Lambe, 2015, p. 361). Many new part-time clinical faculty have received little to no preparation in nursing education and often teach how they were taught (Koharchik, 2014). Hsu (2006) indicated, further, that nursing education has become more complex and the setting has become technology rich, adding another layer of complexity for part-time faculty in clinical roles. Effective clinical faculty help students become clinically competent (Hsu, 2006) in this rapidly changing milieu. Therefore, recruiting and retaining high-quality part-time clinical faculty is essential to the success of nursing students and programs. Often, new part-time clinical faculty are expected to arrive at the clinical faculty position with the knowledge and skills to teach in nursing programs (Schaar, Titzer, & Beckham, 2015). However, Santisteban and Egues (2014) noted that part-time clinical faculty “may be unintentionally unsupported in acquiring the mastery of essential competencies associated with the educator role” (p. 154). Difficult transitions into their new role as clinical faculty may leave new part-time clinical faculty unsatisfied in their new role, creating a problem with retention. These problems are widespread (Silver Dunker & Manning, 2018) and have been reported at all levels. What is known about the best way to support clinicians as they transition to the role of part-time clinical faculty? The purpose of this literature review was to identify issues and problems related to assumption of the part-time clinical faculty role, as well as to identify successful practices for nursing programs. A search of CINAHL® through EBSCOhost and OVID® were conducted to identify evidence focused on part-time nursing faculty. These databases were the most appropriate to search for relevant literature regarding part-time nursing clinical faculty. The key words used were faculty, nursing and part-time or adjunct and clinical. To reflect the current literature, articles were searched from 2013 to 2018. The articles were limited to those in English and from peer-reviewed journals. The CINAHL search yielded 1,068 results; after reviewing titles and abstracts, a total of 16 articles met the criteria. The OVID search yielded 40 results; nine were included, but six of those were also in the CINAHL search results. Thus, the total number of articles included in this integrated review was 19. The quality of evidence from the review conducted was weak to moderate, with articles ranging from Level IV to Level VII (Melnyk & Fineout-Overholt, 2014) (Table A; available in the online version of this article). Five themes were identified as essential to contributing to the success in recruiting and retaining qualified part-time clinical faculty. The themes included Mandatory/Structured Orientation; Mentoring; Issues of Pay, Compensation, and the Transient Nature of Contract Work; Support; and Communication/Connection. The themes were identified after reviewing the articles, and many overlap because some of them share characteristics. However, each theme may need to be considered when working with part-time clinical nursing faculty. Orientation is an essential component for developing part-time clinical faculty (Carlson 2015b; Gies, 2013; Hall & Chichester, 2014; Koharchik, 2017; Koharchik & Jakub, 2014; Woodworth, 2017). New part-time clinical faculty were found to be at a disadvantage when they were given inadequate orientation (Koharchik, 2014). Requiring attendance is crucial (Gies, 2013, Koharchik, 2017, Koharchik & Jakub, 2014). Orientation needs to adequately prepare part-time clinical faculty (Schaar et al., 2015) for their new role and required responsibilities. Woodworth (2017) indicated that adequate orientation supports retention of faculty. Both formal and informal orientation are important for ensuring new part-time clinical faculty success (Roberts et al., 2013). Fura and Symanski (2014) suggested that general orientation be videotaped and used as a future reference for new part-time faculty unable to attend the orientation in person. Orientation needs to provide help that is specific to the developmental needs of part-time clinical faculty (Gies, 2013). Examples of this include successful clinical teaching strategies, recognizing and managing inappropriate student behavior, familiarizing oneself with instructional and campus technology, recognizing role strain (Gies, 2013), being familiar with hospital and school of nursing policies and procedures (Hall & Chichester, 2014), and being aware of the expectations and needs of course faculty and the program (Santisteban & Egues, 2014). Setting expectations, role modeling, and introducing essential policies and procedures were also important orientation components (Gies, 2013). Roberts et al. (2013) indicated that part-time clinical faculty require an orientation that focuses specifically on their educational responsibilities of supervising nursing students within the clinical area. Roberts et al. (2013) reported in their study that part-time clinical faculty stated that information received at their formal orientation was viewed as helpful and beneficial. However, the orientation was general in nature and did not meet all of the new faculty needs. Therefore, including new part-time faculty in the planning of orientation may be beneficial (Santisteban & Egues, 2014). New part-time clinical faculty indicated that manuals providing information about expectations of the faculty role, including background of the department and institution, would be beneficial. Offering orientation at a variety of times may help with attendance because many new part-time clinical faculty have full-time work requirements elsewhere (Santisteban & Egues, 2014). Koharchik (2017) indicated that having an all-day orientation prior to the start of the semester was beneficial. In that example, faculty were given breakfast and lunch and were compensated for parking. New faculty arrived early and were given information on accessing online resources. Policies were addressed, course objectives were reviewed, and written assignments were explained. An optional boot camp was available to part-time faculty to review procedures, dosage calculations, cardiopulmonary resuscitation, and curriculum concept mapping (Koharchik, 2017). Carlson (2015b) conducted a nationwide study of 533 part-time clinical faculty who teach in baccalaureate nursing programs and reported that 90% received an orientation; however, 47% reported that the orientation was brief (only approximately 2 hours). Orientation varied from a formal classroom setting (54%) to informal one-to-one (55%) orientation provided by nursing faculty. The orientation provided by the nursing program was viewed as helpful or very helpful by 77% of respondents (Carlson, 2015b). The literature revealed a few different models of orientation. The Eastern Shore Faculty Academy and Mentorship Initiative was designed to develop expert clinicians into part-time faculty (Hinderer, Jarosinski, Seldomridge, & Reid, 2016). The benefits of this program were that graduates “understand the expectations of clinical faculty, how to design and manage experiences in the clinical setting, and how to provide feedback to improve student performance” (Reid, Hinderer, Jarosinski, Mister, & Seldomridge, 2013, p. 291). 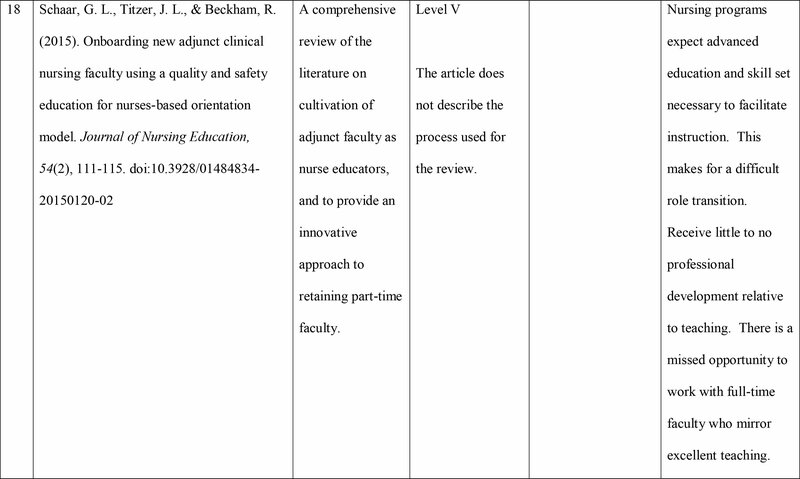 The Quality and Safety Education for Nurses competency framework was used by Schaar et al. (2015) to develop an orientation model. The topics included patient-centered care, teamwork and collaboration, informatics, quality improvement, safety, and evidence-based practice. Learning objectives were developed, and orientation activities were used to assist new part-time clinical faculty as they navigated their role as educators. 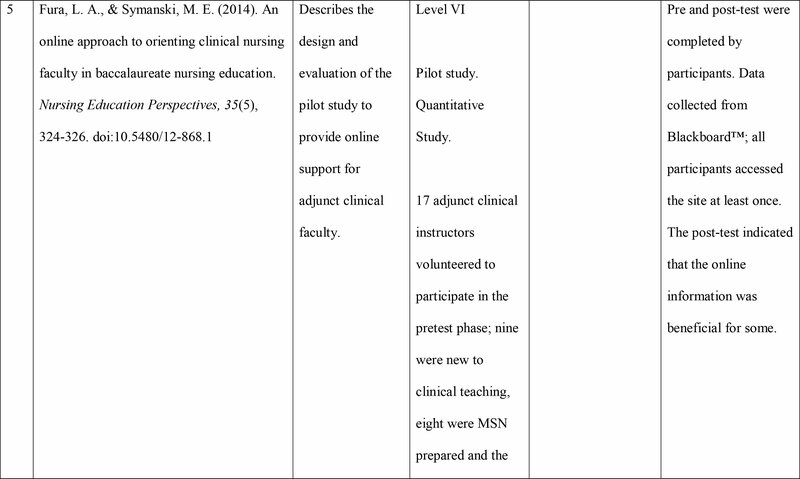 Silver Dunker and Manning (2018) reported on a pilot study of a 4-hour Live Continuing Education Program for Adjunct Clinical Nursing Faculty. This program transitioned from online to a live continuing education for adjunct clinical faculty. Positive feedback was received after the education session. Faculty indicated that the live format was beneficial, and they enjoyed the discussions with peers, as well as breakout sessions after the video vignettes. Other faculty comments were related to learning how to give feedback, read the syllabus, safely send a student to an observation, and praise and motivate students. One faculty indicated that, “I am a new clinical faculty, and this workshop helped me to learn that I am a part of the organization and I can contribute to the curriculum and offer ideas to improve the clinical experience” (p. 17). Areas for improvement included providing information for all clinical faculty (regardless of experience level) and increasing the amount of time provided. There was also strong support for moving the program from online to live (Silver Dunker & Manning, 2018). It is common for nursing programs to use a combination of part-time and full-time faculty to fulfill clinical needs. Kring, Ramseur, and Parnell (2013) reported that there were no statistically significant differences between using school faculty and hospital adjunct clinical instructors when new graduate nurses evaluated their medical–surgical clinical instructors. However, hospital adjunct clinical instructors in that study attended a 3-day intensive workshop providing information on the role of the clinical instructor and handling student issues, including helpful role-playing scenarios (Kring et al., 2013). Orienting new part-time faculty well can be a challenge for nursing programs. Meyer (2017) noted that two specific learning needs of new part-time faculty were “knowledge of student development and rigor in evaluating student performance” (p. 82). Finding faculty who have experience in both clinical settings and teaching is often difficult. Because new faculty are not familiar with evaluating student performance, they may be “reluctant to give failing clinical grades” as well as “providing candid evaluations of students who are struggling” (Meyer, 2017, p. 82). Meyer (2017) stated that faculty and programs may have added levels of stress when orienting new part-time nursing faculty. A challenge with orienting part-time faculty is that many clinicians do not understand the academic setting or the complexity of nursing education. Hiring large numbers of part-time clinical faculty may also increase responsibilities of full-time faculty. Orienting, mentoring, and supervising takes extensive amounts of time from full-time faculty. Also, part-time faculty typically focus on teaching and not on advising, faculty governance, and committee work; this becomes “enormously [difficult] for full-time faculty because [the] burden of program-wide effort falls on shoulders of full-time faculty members along with [the] additional burden of constant mentoring/orienting new people” (Meyer, 2017, p. 83). Mentoring clinical faculty as they assume new responsibilities has been effective for some. Gies (2013) stated that the benefits of strong mentoring programs may help build a consistent pool of adjunct nursing faculty, which “might help benefit student learning and [support the] institution's mission” (p. 36). Part-time clinical faculty need preceptors who are both expert instructors and competent clinicians to facilitate a smooth transition into their role as part-time clinical faculty (Hall & Chichester, 2014; Santisteban & Egues, 2014). Woodworth (2017) reported that quality mentoring also helps to retain faculty. Roberts et al. (2013) indicated that part-time clinical faculty needed support from either the course coordinator or a designated mentor. Several part-time faculty reported that the course coordinator was viewed as their mentor. Koharchik (2017) described the mentoring process at one institution as including a mentor who was the designated faculty/course coordinator for the specific clinical course. The most beneficial mentors were those who initiated contact with part-time faculty and those who made visits to clinical sites (Koharchik, 2017; Roberts et al., 2013). Faculty who did not have a mentor felt alone and disconnected (Roberts et al., 2013) from the academic enterprise. Mentoring is crucial, yet often overlooked in facilitating new faculty transition (Reid et al., 2013). Santisteban and Egues (2014) described mentoring as a complete initiative that must have the appropriate resources, expectations, and a specific purpose. Experienced part-time clinical faculty may be appropriate mentors for new part-time clinical faculty (Santisteban & Egues, 2014). It is necessary to elicit part-time clinical faculty input, and new faculty could help design and implement the mentoring program. It is important that follow up is made with the mentee by the mentor; therefore, monthly progress reports are essential for this program support and to provide continuous feedback (Santisteban & Egues, 2014). Building relationships facilitates the development and retention of nursing faculty (Gies, 2013). For these reasons, mentoring is essential to developing and supporting high-quality part-time clinical faculty (Meyer, 2017). Part-time clinical faculty are generally on semester-to-semester contracts and usually paid for the number of credit or clinical hours taught (Koharchik, 2014). Clinical hours reflect the time spent with students in the clinical setting and not the pre- and postwork that is needed for successful clinical teaching. Patient assignments are made by faculty before clinical rotation starts, and students require formal and informal feedback regarding written assignments and student evaluations; these activities can be time consuming and add to faculty workload. Meyer (2017) noted that the use of part-time nursing faculty was “more economical and cost-effective than that of full-time faculty” (p. 83). However, finding qualified part-time nursing faculty has been difficult because of the lower pay offered in academia and lack of benefits (Carlson, 2015a; Meyer, 2017). Also, many new part-time clinical faculty do not understand the time commitments required for successful student outcomes. Carlson (2015a) noted that many part-time clinical faculty leave their academic positions due to extended or underdefined time commitments outside of clinical supervision hours. Respondents in Meyer's (2017) study indicated that part-time nursing faculty “were only paid to teach, they were not engaged in and did not take ownership for the overall nursing education program” (p. 83). Roberts et al. (2013) indicated that one part-time clinical faculty member who worked as a full-time clinician stated, “I was barely surviving week to week because I didn't have time to do the paperwork” (p. 299). Woodworth (2017) reported that full-time employment outside of the academic setting negatively affected the intent of part-time clinical faculty to stay in the academic setting. Many part-time clinical faculty stay in full-time positions elsewhere to receive higher wages and benefits (Woodworth, 2017). Koharchik (2014) described another drawback as the lack of stability related to part-time faculty semester-to-semester contracts. Depending on the schedule within nursing programs, courses may be offered only once per year, and there is no guarantee that part-time faculty will be needed the following semester. Part-time faculty also face the challenge of changing clinical sites due to the large number of students needing placements within the hospital setting (Carlson, 2015a; Koharchik, 2017). With frequent changes in clinical sites, it may be difficult to build relationships with hospital staff (Koharchik, 2014). Several studies have identified support as essential to the success of new part-time clinical faculty (Carlson, 2015a; Roberts et al., 2013). Part-time clinical faculty have indicated that they felt a lack of support and respect and, for this reason, chose to leave their positions (Carlson, 2015a). Part-time clinical faculty indicated a need “to feel supported in their role and have access to course materials and a designated mentor” (Roberts et al., 2013, p. 299). The most common support materials provided included syllabi, information on student evaluation procedures, and information on the process for handling student problems. Less commonly reported materials included faculty handbooks and course management system education (Carlson, 2015b). Flood and Robinia (2014) noted that didactic faculty can help support clinical faculty by providing easily accessible course materials, lecture notes, and current research articles. Didactic faculty also may demonstrate support by integrating skills videos, case studies, and video clips into orientation, and photographs may help bridge the gap between classroom and clinical (Flood & Robinia, 2014). Koharchik (2014) indicated that when faculty do not understand curriculum and policy development, they may allow students to perform skills they have not learned. This compromises safety and makes evaluation difficult. Communication with the nursing program and a sense of connection or belonging to the faculty at large and the program as a whole are also essential components of recruiting and retaining part-time clinical faculty. Many part-time faculty indicated that they felt a lack of connection to and inclusion in their nursing program (Roberts et al., 2013). Santisteban and Egues (2014) and Koharchik (2014) noted that many part-time clinical faculty are not recognized for their roles as critical members of the educational institution and often were excluded from nursing program activities. Part-time faculty who felt included received invitations to faculty meetings and were given specific “benefits that acknowledged their value” (Roberts et al., 2013, p. 300), such as invitations to holiday or celebratory parties and student events such as pinning and graduation (Koharchik, 2017). Koharchik (2017) added an end-of-semester meeting, which allowed part-time faculty to provide feedback to the course coordinator. Development of course coordinators can be beneficial because they act as liaisons between nursing programs and part-time clinical faculty. It is also important that part-time clinical faculty can attend meetings and workshops. By formally receiving invitations to these events, part-time clinical faculty know they are welcome to attend (Flood & Robinia, 2014). Meyer (2017) noted that part-time nursing faculty often have “a lack of knowledge regarding the interconnectedness of various aspects of the nursing curriculum, including program mission, philosophy, and program outcomes” (p. 82). Part-time clinical faculty often “have not ‘bought into’ the curriculum at our school” (p. 82). Santisteban and Egues (2014) noted that part-time clinical faculty have few opportunities to shadow experienced faculty and thus often feel insecure and disconnected from their role. Koharchik (2017) included part-time faculty on committee work if they chose, compensating them for their time and expertise. Fura and Symanski (2014) reported using online courseware (Blackboard™) as a tool for communicating with part-time clinical faculty. Faculty indicated they were able to find materials on this site; however, it was primarily used for conversations, which had been the initial plan with the discussion boards (Fura & Symanski, 2014). Roberts and Glod (2013) reported that part-time clinical faculty may teach in several nursing programs and thus be less familiar and less involved in faculty meetings and the curricula. Communication with part-time clinical faculty is essential to helping faculty transition into the new role. The use of online courseware, as well as visits to the clinical sites, can help facilitate communication. Part-time clinical faculty are essential to nursing program success during this faculty nursing shortage and likely to remain a prominent employment model in nursing programs as institutions seek to address the faculty shortage (Fura & Symanski, 2014; Gies, 2013; Hinderer et al., 2016; Reid et al., 2013; Woodworth, 2017). Part-time faculty are filling a faculty void faced by many nursing programs. Without the use of these clinical experts, nursing programs may be forced to turn away even larger numbers of qualified students. Meyer (2017) noted that part-time clinical faculty may help decrease the stress on full-time faculty, allowing them to focus on classroom teaching and scholarly activities such as research. However, the larger numbers of part-time faculty used within nursing programs also increases full-time faculty workload related to orientation, mentoring, and supervision activities; these may be very time consuming (Meyer, 2017). Providing mandatory structured orientation and integrating feedback from successful part-time clinical faculty are essential to facilitating the transition of new part-time clinical faculty into the clinical supervision role. It is necessary to include information on the nursing program curriculum, expectations, and clinical faculty's role in orientation (Gies, 2013; Koharchik, 2017; Meyer, 2017; Roberts et al., 2013). Although orientation is an important first step to developing successful part-time clinical faculty, mentors play a key role in continued support and development of part-time clinical faculty (Gies, 2013; Hall & Chichester, 2014; Koharchik, 2017; Meyer, 2017; Roberts et al., 2013; Santisteban & Egues, 2014; Woodworth, 2017). Intentional mentoring with assigned mentors is needed for new faculty to feel supported in their role and connected to their nursing program (Koharchik, 2017; Roberts et al., 2013). It would be beneficial for mentors to meet frequently with their mentee and make visits to the clinical site. Progress reports and frequent feedback may be obtained from both the mentor and mentee. Building relationships helps support new part-time clinical faculty in their role (Gies, 2013; Woodworth, 2017). New part-time clinical faculty need to be aware of the compensation provided by the nursing program. Time is valuable to all parties involved, and new faculty need to be aware of the commitment they are making. For example, outlining the time spent without students preparing assignments and the time evaluating and grading student work is important to communicate because these activities are often time consuming (Carlson, 2015a; Meyer, 2017; Roberts et al., 2013, Woodworth, 2017). Recognizing new clinical faculty for their efforts may be beneficial. Ways to recognize their time and effort may be including new part-time clinical faculty in faculty meetings, holiday celebrations, and commencement activities. Not only will part-time clinical faculty feel more valued, but they will likely feel a sense of connection to the college or university, and this may improve retention (Flood & Robinia, 2014; Koharchik, 2017; Meyer, 2017; Roberts et al., 2013). Although the use of part-time clinical faculty is not new to nursing, it continues to remain a persistent problem. As nursing programs continue to hire increasing numbers of part-time clinical faculty, attention paid to the themes identified in this integrated review may help to develop and retain these faculty. 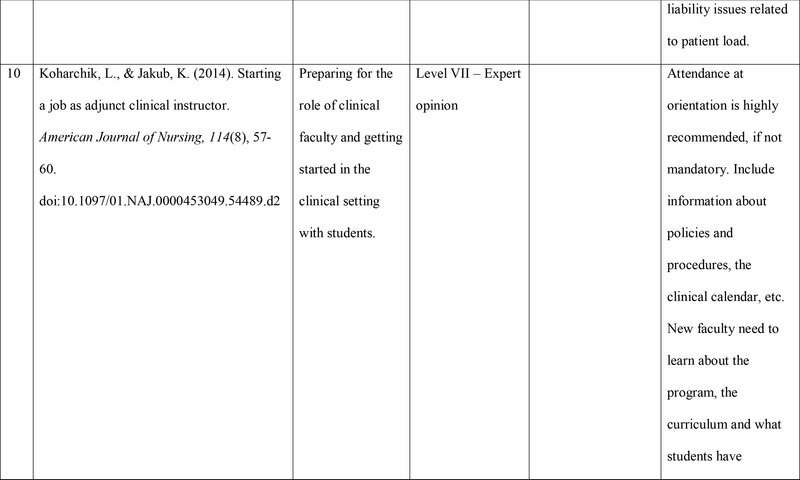 The review focused on the use of part-time clinical faculty. Although studies exist on what clinical faculty need, emphasis was placed on part-time faculty. Only articles appearing from 2013 to 2018 were included; older literature may have provided additional insight. Some weaknesses of the studies included the following. Carlson's (2015b) study was limited to part-time clinical faculty in prelicensure baccalaureate programs. Results may not be robust because of self-selection bias that may exist in convenience sampling. The researcher developed the questions; reliability and validity of the instrument was not reported. Carlson (2015a) was limited to only part-time clinical nursing faculty teaching in prelicensure baccalaureate nursing programs, making generalizability to all programs limited. The survey was developed by Carlson (2015a); reliability and validity were not reported. The study by Kring et al. (2013) had a small sample size and a low response rate and was limited to sampling in one state. Meyer's (2017) study reported that part-time nursing faculty indicated that the terminology used on the tool was confusing. The qualitative responses were not differentiated according to the type of teaching (clinical, classroom, or both). Several of the articles used in this integrative review were expert opinion or reports of single program studies. The overall strength of the evidence in this review was weak to moderate; further research is necessary to determine better what factors are essential in recruiting and retaining qualified part-time clinical faculty. Clinical education is imperative to developing safe, competent nursing practice and novice nurses who are adequately prepared for the complexities of professional practice. As the nursing faculty shortage worsens, the number of part-time clinical nursing faculty continues to increase. The need to adequately prepare part-time clinical nursing faculty for their role continues to be a persistent problem for nursing programs. Identifying the learning and developmental needs of part-time clinical faculty is essential to ensuring that nursing programs are fully staffed and may lead to graduating safe, competent new nurses. Benner, P., Sutphen, M., Leonard, V. & Day, L. (2009). Educating nurses: A call for radical transformation. San Francisco, CA: Jossey-Bass. Kring, D.L., Ramseur, N. & Parnell, E. (2013). How effective are hospital adjunct clinical instructors?Nursing Education Perspectives, 34, 34–36. Melnyk, B. & Fineout-Overholt, E. (2014). Evidence-based practice in nursing and healthcare: A guide to best practice (3rd ed.). Philadelphia, PA: Wolters Kluwer Health. Schaar, G.L., Titzer, J.L. & Beckham, R. (2015). Onboarding new adjunct clinical nursing faculty using a quality and safety education for nurses-based orientation model. Journal of Nursing Education, 54, 111–115. 1 Carlson, J. S. (2015a). Factors influencing retention among part-time clinical nursing faculty. Nursing Education Perspectives, 36(1), 42–45. 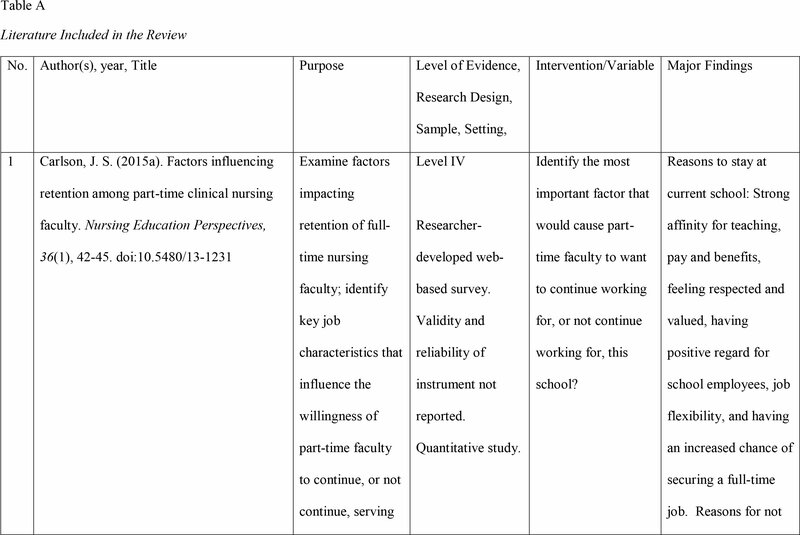 doi:10.5480/13-1231 Examine factors impacting retention of full-time nursing faculty; identify key job characteristics that influence the willingness of part-time faculty to continue, or not continue, serving as clinical faculty for a program. Level IV Researcher-developed web-based survey. Validity and reliability of instrument not reported. Quantitative study. 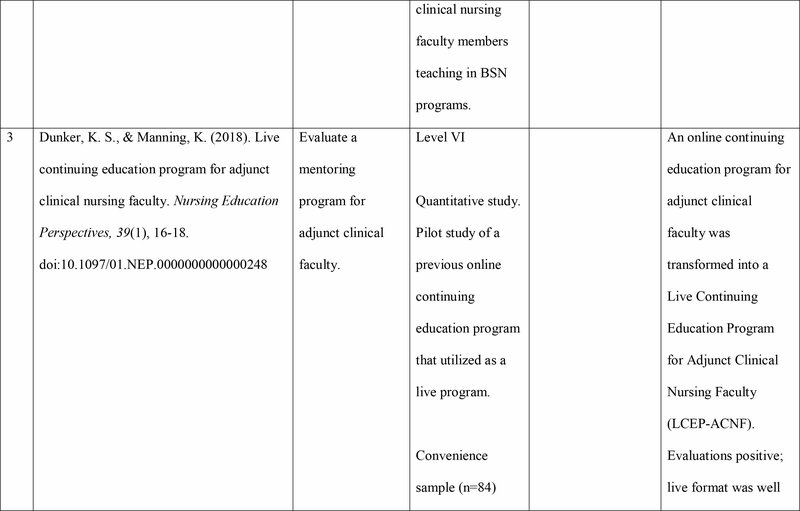 National sample using convenience sampling of part-time clinical nurse faculty teaching in BSN programs throughout the U.S. (n = 553) Identify the most important factor that would cause part-time faculty to want to continue working for, or not continue working for, this school? Reasons to stay at current school: Strong affinity for teaching, pay and benefits, feeling respected and valued, having positive regard for school employees, job flexibility, and having an increased chance of securing a full-time job. Reasons for not wanting to stay: Life and family conflicts including their issues with primary job, pay disparity between practice and teaching, increased workload, changing clinical schedules or time slots, lack of support and respect, disorganized and lack of teamwork. 2 Carlson, J. S. (2015b). Orientation, evaluation, and integration of part-time nursing faculty. 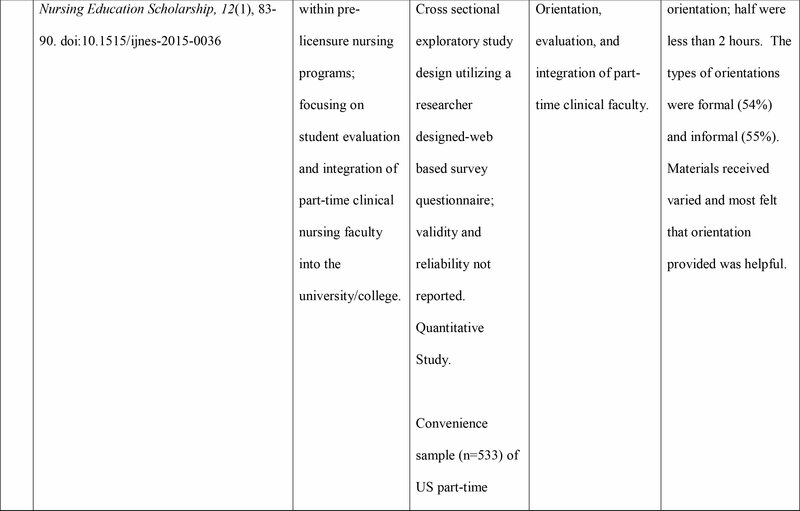 International Journal of Nursing Education Scholarship, 12(1), 83-90. doi:10.1515/ijnes-2015-0036 Summarize orientation practices existing within prelicensure nursing programs; focusing on student evaluation and integration of part-time clinical nursing faculty into the university/college. Level IV Cross sectional exploratory study design utilizing a researcher designed-web based survey questionnaire; validity and reliability not reported. Quantitative Study. 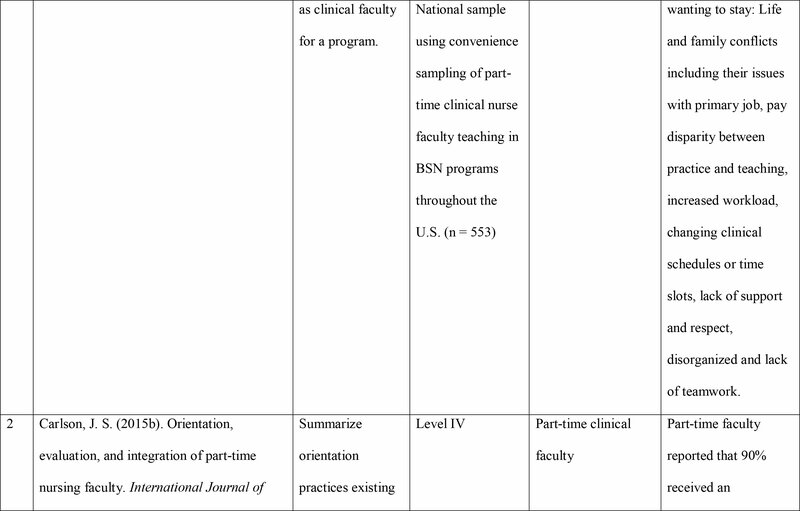 Convenience sample (n=533) of US part-time clinical nursing faculty members teaching in BSN programs. Part-time clinical faculty Orientation, evaluation, and integration of part-time clinical faculty. Part-time faculty reported that 90% received an orientation; half were less than 2 hours. The types of orientations were formal (54%) and informal (55%). Materials received varied and most felt that orientation provided was helpful. 3 Dunker, K. S., & Manning, K. (2018). Live continuing education program for adjunct clinical nursing faculty. Nursing Education Perspectives, 39(1), 16–18. 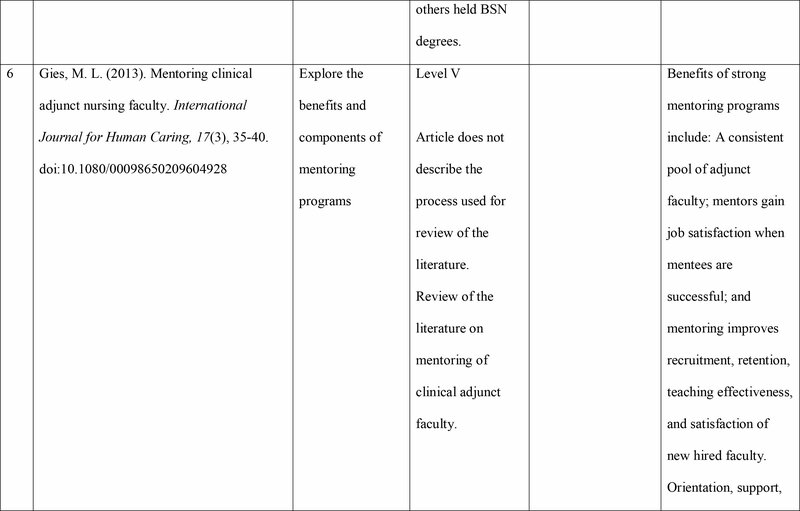 doi:10.1097/01.NEP.0000000000000248 Evaluate a mentoring program for adjunct clinical faculty. Level VI Quantitative study. Pilot study of a previous online continuing education program that utilized as a live program. Convenience sample (n=84) faculty members from 3 Massachusetts nursing programs. An online continuing education program for adjunct clinical faculty was transformed into a Live Continuing Education Program for Adjunct Clinical Nursing Faculty (LCEP-ACNF). Evaluations positive; live format was well received. Peer discussions and breakout session after video vignettes were very beneficial and respondents requested more time for these. 4 Flood, L. S., & Robinia, K. (2014). Bridging the gap: Strategies to integrate classroom and clinical learning. Nurse Education in Practice, 14, 329–332. 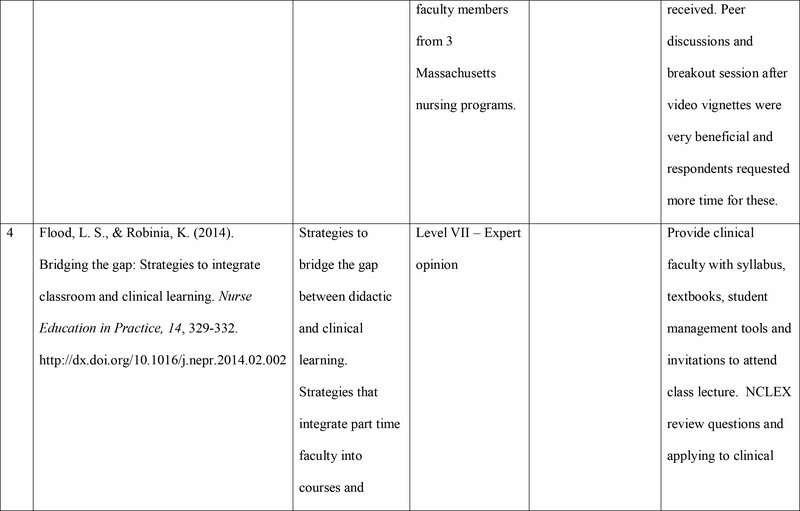 http://dx.doi.org/10.1016/j.nepr.2014.02.002 Strategies to bridge the gap between didactic and clinical learning. 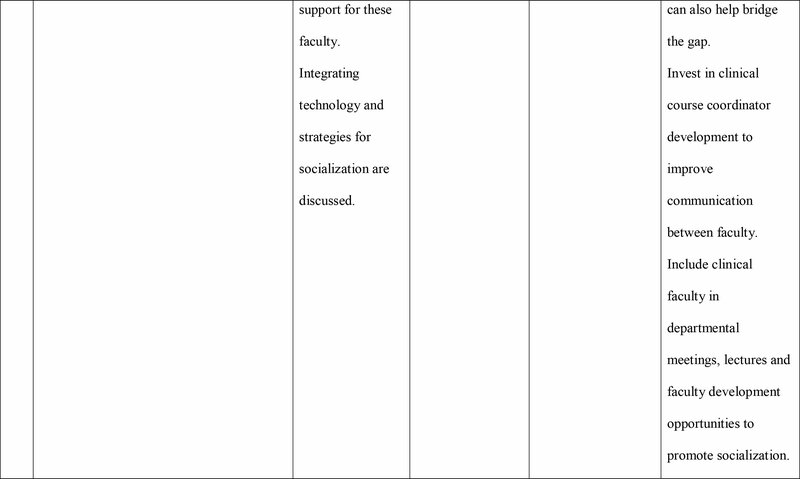 Strategies that integrate part time faculty into courses and support for these faculty. Integrating technology and strategies for socialization are discussed. Level VII – Expert opinion Provide clinical faculty with syllabus, textbooks, student management tools and invitations to attend class lecture. NCLEX review questions and applying to clinical can also help bridge the gap. Invest in clinical course coordinator development to improve communication between faculty. Include clinical faculty in departmental meetings, lectures and faculty development opportunities to promote socialization. 5 Fura, L. A., & Symanski, M. E. (2014). An online approach to orienting clinical nursing faculty in baccalaureate nursing education. 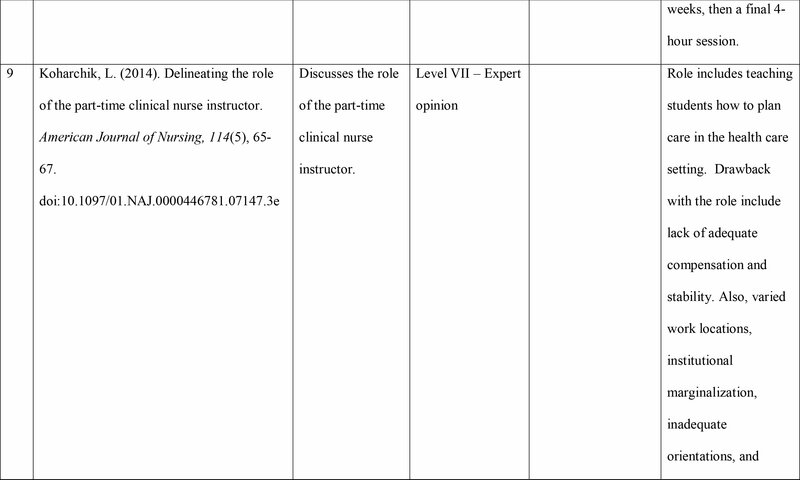 Nursing Education Perspectives, 35(5), 324–326. doi:10.5480/12-868.1 Describes the design and evaluation of the pilot study to provide online support for adjunct clinical faculty. Level VI Pilot study. Quantitative Study. 17 adjunct clinical instructors volunteered to participate in the pretest phase; nine were new to clinical teaching, eight were MSN prepared and the others held BSN degrees. Pre and post-test were completed by participants. Data collected from Blackboard™; all participants accessed the site at least once. The post-test indicated that the online information was beneficial for some. 6 Gies, M. L. (2013). Mentoring clinical adjunct nursing faculty. International Journal for Human Caring, 17(3), 35–40. doi:10.1080/00098650209604928 Explore the benefits and components of mentoring programs Level V Article does not describe the process used for review of the literature. Review of the literature on mentoring of clinical adjunct faculty. Benefits of strong mentoring programs include: A consistent pool of adjunct faculty; mentors gain job satisfaction when mentees are successful; and mentoring improves recruitment, retention, teaching effectiveness, and satisfaction of new hired faculty. Orientation, support, and follow up were identified as themes. 7 Hall, N., & Chichester, M. (2014). How to succeed as an adjunct clinical nurse instructor. Nursing for Women's Health, 18(4), 341–344. 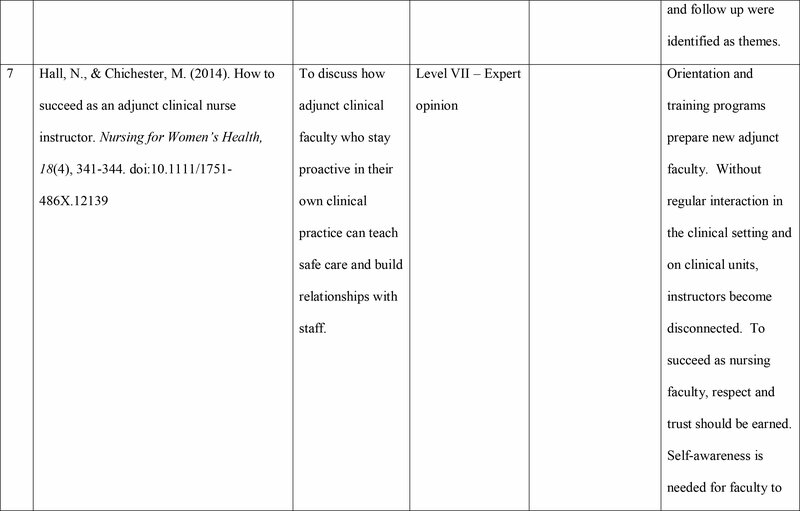 doi:10.1111/1751-486X.12139 To discuss how adjunct clinical faculty who stay proactive in their own clinical practice can teach safe care and build relationships with staff. Level VII – Expert opinion Orientation and training programs prepare new adjunct faculty. Without regular interaction in the clinical setting and on clinical units, instructors become disconnected. To succeed as nursing faculty, respect and trust should be earned. Self-awareness is needed for faculty to continue to learn and grow. 8 Hinderer, K. A., Jarosinski, J. M., Seldomridge, L. A., & Reid, T. P. (2016). From expert clinician to nurse educator. Outcomes of a faculty academy initiative. Nurse Educator, 41(4), 194–198. 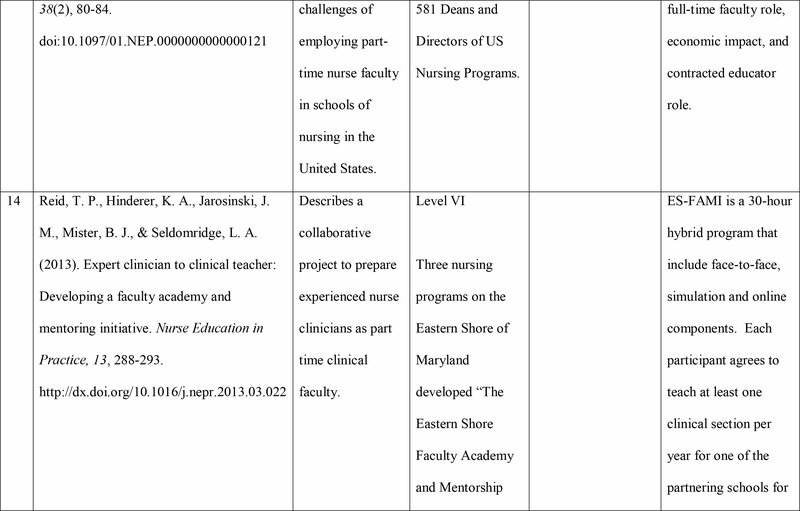 doi:10.1097/NNE.0000000000000243 The Eastern Shore Faculty Academy and Mentorship Initiative was developed to help transition novice nurses into part-time clinical faculty. Explores program development and use. Level IV 32 people completed the program over a 3-year period. The ESFAMI was a collaboration between 3 nursing programs. Goal was to take expert clinicians and develop them into part-time clinical faculty. The academy had three phases: half-day face-to face introduction, then an 8-hour module was completed over 2 weeks, then a final 4-hour session. 9 Koharchik, L. (2014). Delineating the role of the part-time clinical nurse instructor. American Journal of Nursing, 114(5), 65–67.doi:10.1097/01.NAJ.0000446781.07147.3e Discusses the role of the part-time clinical nurse instructor. Level VII – Expert opinion Role includes teaching students how to plan care in the health care setting. Drawback with the role include lack of adequate compensation and stability. Also, varied work locations, institutional marginalization, inadequate orientations, and liability issues related to patient load. 10 Koharchik, L., & Jakub, K. (2014). Starting a job as adjunct clinical instructor. American Journal of Nursing, 114(8), 57-60. doi:10.1097/01.NAJ.0000453049.54489.d2 Preparing for the role of clinical faculty and getting started in the clinical setting with students. Level VII – Expert opinion Attendance at orientation is highly recommended, if not mandatory. Include information about policies and procedures, the clinical calendar, etc. New faculty need to learn about the program, the curriculum and what students have accomplished in prior courses. 11 Koharchik, L. (2017). Supporting adjunct clinical faculty. American Journal of Nursing, 117(9), 58–62. doi:10.1097/01.NAJ.0000524551.58567.c6 Discussion of the strategies used to promote learning and enhance feelings of belonging among adjunct clinical faculty. Level VII – Expert opinion Adjunct faculty are hired to teach based on credit hours or hourly basis and do not receive benefits. They often feel isolated from peers and in many cases perceive their role to be temporary. Orientation is essential to novice faculty. 12 Kring, D. L., Ramseur, N., & Parnell, E. (2013). How effective are hospital adjunct clinical instructors? Nursing Education Perspectives, 34(1), 34–36. http://www.nln.org/newsroom/newsletters-and-journal/nursing-education-perspectives-journal To determine if hospital adjunct clinical instructors are as effective as faculty employed by schools of nursing. Level VI Descriptive Study. Quantitative Study. Convenience sample of 49 new graduate nurses in North Carolina. Comparison of effectiveness between hospital adjunct clinical instructors and faculty employed by schools of nursing. Surveys were sent to new graduate nurses. Adjunct instructors and school faculty scores indicated a high level of effectiveness. The difference between the groups was not statistically significant. 13 Meyer, J. R. (2017). Administering perspectives of advantages and challenges of employing part-time faculty in nursing education programs: Two sides of the same coin. 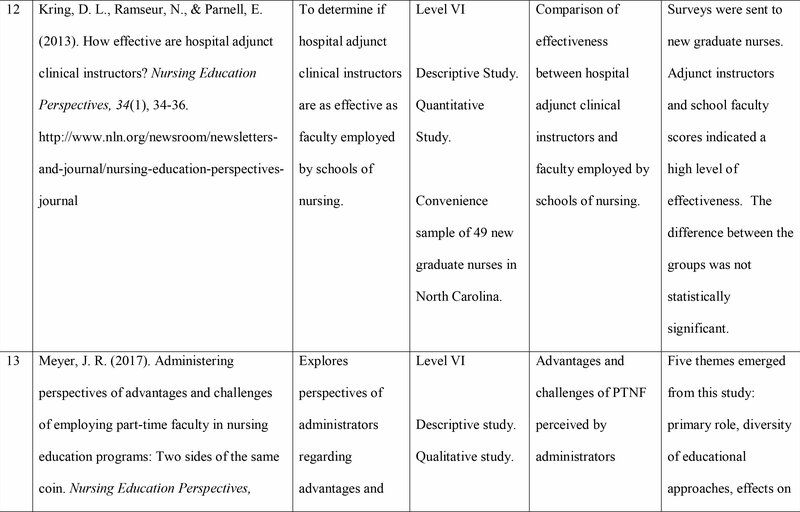 Nursing Education Perspectives, 38(2), 80–84.doi:10.1097/01.NEP.0000000000000121 Explores perspectives of administrators regarding advantages and challenges of employing part-time nurse faculty in schools of nursing in the United States. Level VI Descriptive study. Qualitative study. 581 Deans and Directors of US Nursing Programs. Advantages and challenges of PTNF perceived by administrators Five themes emerged from this study: primary role, diversity of educational approaches, effects on full-time faculty role, economic impact, and contracted educator role. 14 Reid, T. P., Hinderer, K. A., Jarosinski, J. M., Mister, B. J., & Seldomridge, L. A. (2013). Expert clinician to clinical teacher: Developing a faculty academy and mentoring initiative. Nurse Education in Practice, 13, 288–293. http://dx.doi.org/10.1016/j.nepr.2013.03.022 Describes a collaborative project to prepare experienced nurse clinicians as part time clinical faculty. 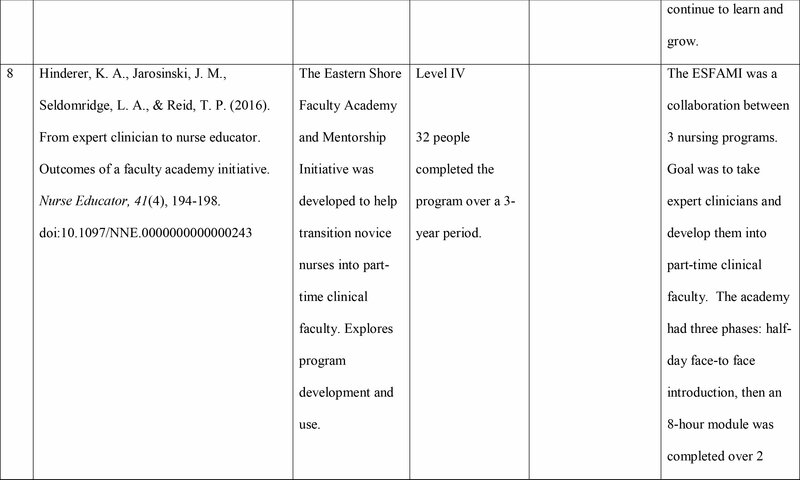 Level VI Three nursing programs on the Eastern Shore of Maryland developed “The Eastern Shore Faculty Academy and Mentorship Initiative (ES-FAMI).” ES-FAMI is a 30-hour hybrid program that include face-to-face, simulation and online components. Each participant agrees to teach at least one clinical section per year for one of the partnering schools for a minimum of 2 years. Topics include: Clinical teaching, creating a positive learning environment, making patient assignments, and managing multiple roles. 15 Roberts, K. K., Chrisman, S. K., & Flowers, C. (2013). The perceived needs of nurse clinicians as they move into an adjunct clinical faculty role. Journal of Professional Nursing, 29(5), 295–301. 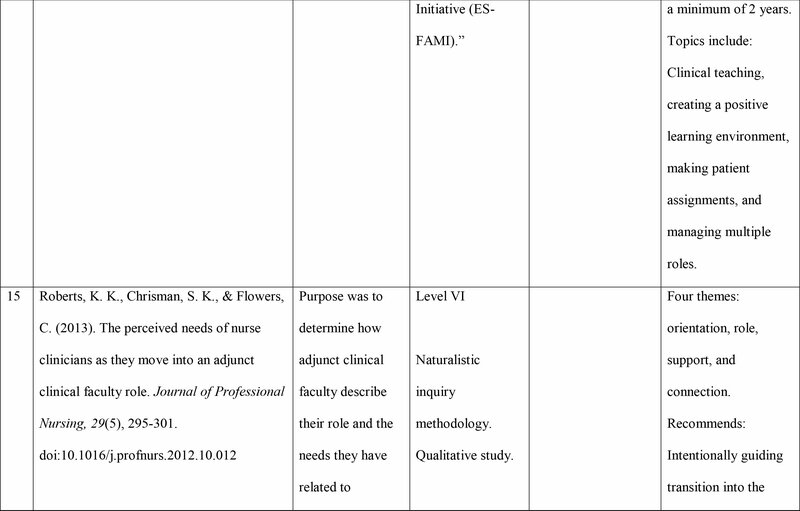 doi:10.1016/j.profnurs.2012.10.012 Purpose was to determine how adjunct clinical faculty describe their role and the needs they have related to actualizing that role. Level VI Naturalistic inquiry methodology. Qualitative study. 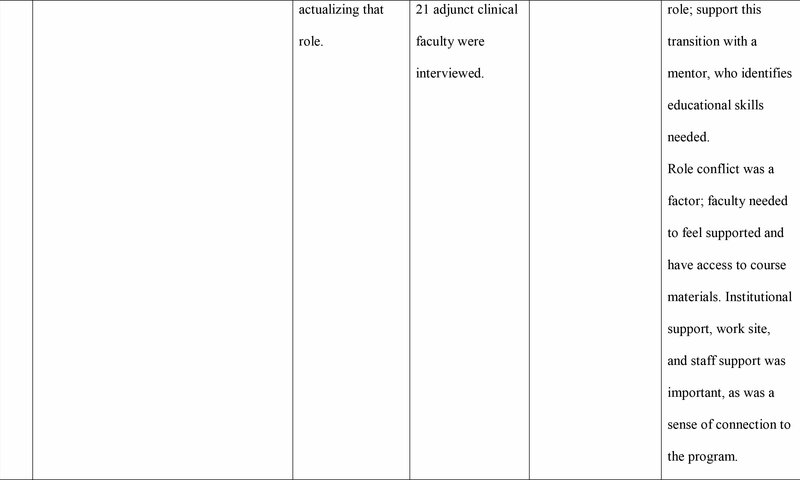 21 adjunct clinical faculty were interviewed. Four themes: orientation, role, support, and connection. Recommends: Intentionally guiding transition into the role; support this transition with a mentor, who identifies educational skills needed. Role conflict was a factor; faculty needed to feel supported and have access to course materials. Institutional support, work site, and staff support was important, as was a sense of connection to the program. 16 Roberts, S. J., & Glod, C. (2013). Faculty roles: Dilemmas for the future of nursing education. 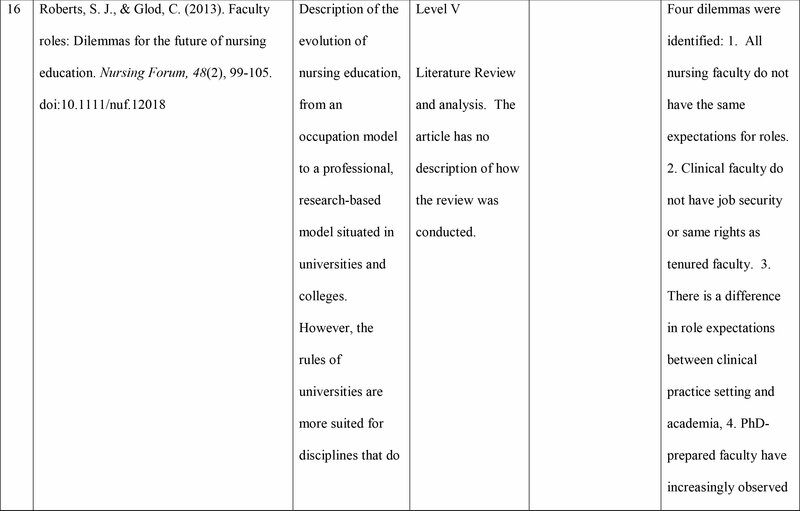 Nursing Forum, 48(2), 99–105.doi:10.1111/nuf.12018 Description of the evolution of nursing education, from an occupation model to a professional, research-based model situated in universities and colleges. However, the rules of universities are more suited for disciplines that do not have a clinical emphasis. Level V Literature Review and analysis. The article has no description of how the review was conducted. Four dilemmas were identified: 1. All nursing faculty do not have the same expectations for roles. 2. Clinical faculty do not have job security or same rights as tenured faculty. 3. There is a difference in role expectations between clinical practice setting and academia, 4. PhD- prepared faculty have increasingly observed challenges in the academic setting, especially to obtaining tenure and promotion. 17 Santisteban, L., & Egues, A. L. (2014). Cultivating adjunct faculty: Strategies beyond orientation. 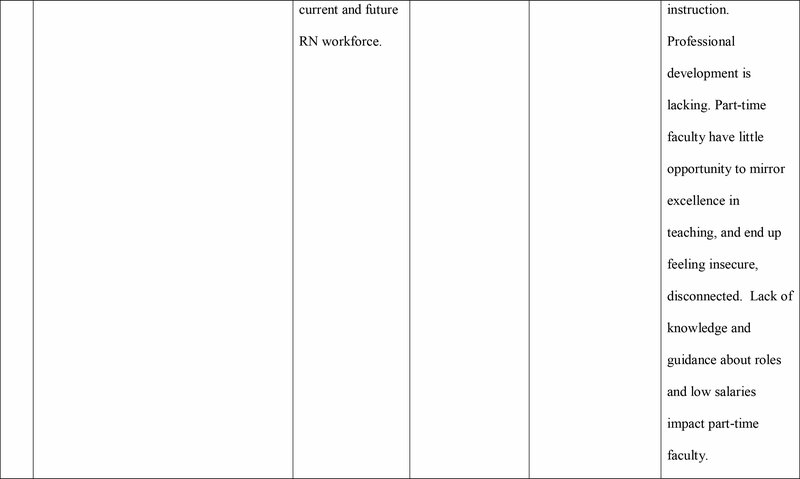 Nursing Forum, 49(3), 152–158. 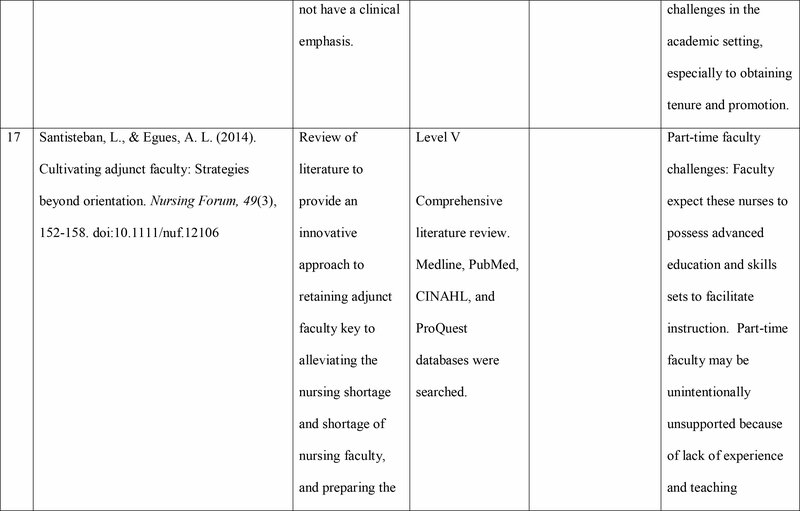 doi:10.1111/nuf.12106 Review of literature to provide an innovative approach to retaining adjunct faculty key to alleviating the nursing shortage and shortage of nursing faculty, and preparing the current and future RN workforce. Level V Comprehensive literature review. Medline, PubMed, CINAHL, and ProQuest databases were searched. Part-time faculty challenges: Faculty expect these nurses to possess advanced education and skills sets to facilitate instruction. Part-time faculty may be unintentionally unsupported because of lack of experience and teaching instruction. Professional development is lacking. Part-time faculty have little opportunity to mirror excellence in teaching, and end up feeling insecure, disconnected. Lack of knowledge and guidance about roles and low salaries impact part-time faculty. 18 Schaar, G. L., Titzer, J. L., & Beckham, R. (2015). Onboarding new adjunct clinical nursing faculty using a quality and safety education for nurses-based orientation model. Journal of Nursing Education, 54(2), 111–115. doi:10.3928/01484834-20150120-02 A comprehensive review of the literature on cultivation of adjunct faculty as nurse educators, and to provide an innovative approach to retaining part-time faculty. Level V The article does not describe the process used for the review. Nursing programs expect advanced education and skill set necessary to facilitate instruction. This makes for a difficult role transition. Receive little to no professional development relative to teaching. There is a missed opportunity to work with full-time faculty who mirror excellent teaching. 19 Woodworth, J. A. (2017). Adjunct nurse faculty demographics and intent to stay teaching. Nurse Educator, 42(6), 295–298. 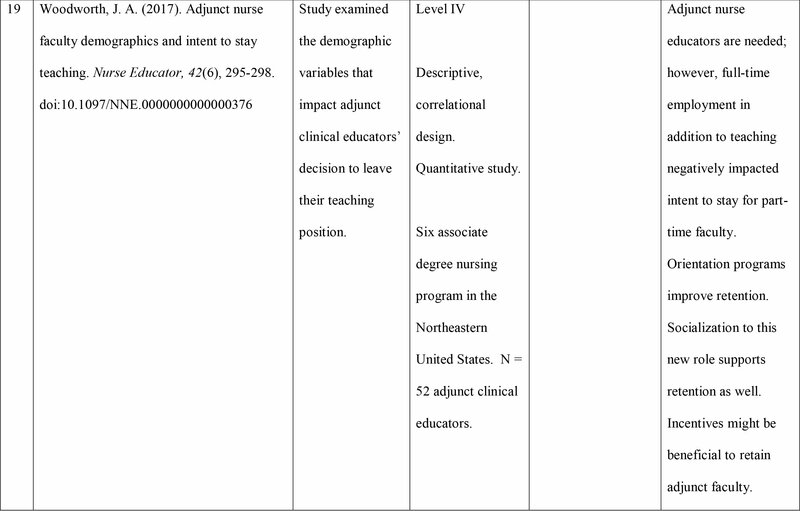 doi:10.1097/NNE.0000000000000376 Study examined the demographic variables that impact adjunct clinical educators' decision to leave their teaching position. Level IV Descriptive, correlational design. Quantitative study. Six associate degree nursing program in the Northeastern United States. N = 52 adjunct clinical educators. Adjunct nurse educators are needed; however, full-time employment in addition to teaching negatively impacted intent to stay for part-time faculty. Orientation programs improve retention. Socialization to this new role supports retention as well. Incentives might be beneficial to retain adjunct faculty. Dr. McPherson is Clinical Assistant Professor, Department of Biobehavioral Health Science, College of Nursing, University of Illinois Chicago, Springfield, Illinois. The author thanks Dr. M. Cecilia Wendler for her time and expertise. Address correspondence to Sara McPherson, PhD, RN, Clinical Assistant Professor, Department of Biobehavioral Health Science, College of Nursing, University of Illinois Chicago, One University Plaza, Springfield, IL 62703-5407; e-mail: saramcph@uic.edu.